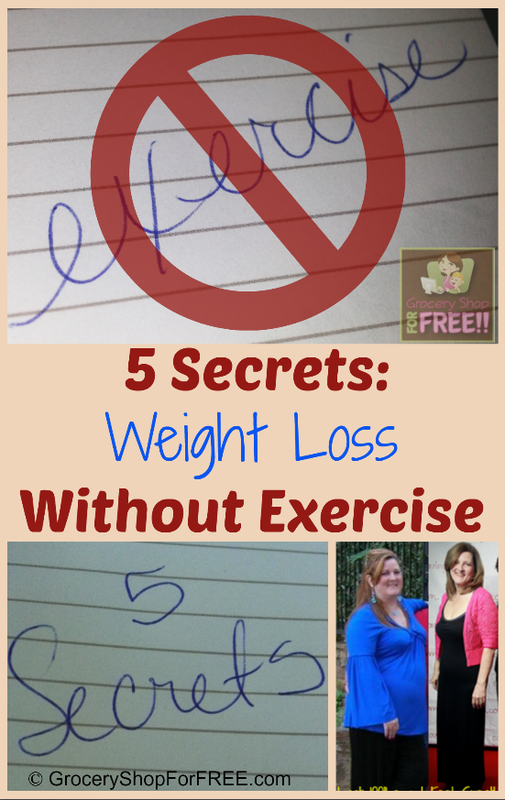 5 Secrets To Weight Loss Without Exercise! You are here: Home / Weight Loss / 5 Secrets To Weight Loss Without Exercise! People sometimes ask me to tell them my secret to losing over 100 lbs without exercise. I have used exercise to lose weight in the past, but, I just gained it back when I quit exercising. I don’t like to exercise, so, it’s not really anything I can use to lose weight. I finally realized in order to lose weight AND keep it off I have to be able to do whatever got me there for the rest of my life. So, when I set out on the journey to lose the weight, I knew exercise wasn’t the way for me. So, let’s back up a little. A few years ago I tore my Achilles tendon in half and had to have surgery. When the Dr. did the pre-surgery blood work they found type II Diabetes. I knew I had to change that and quick. So, as soon as my surgery was over I set out to get the weight off. Now, even if I had wanted to do it with exercise, I couldn’t because I was in bed for months after my surgery and couldn’t walk. When I started weighing out my meat to 4oz for each meal I was really shocked that it wasn’t more than that. Not that I needed more, but, it was less than I had ever eaten at a meal! Restaurants offer a 6oz steak as the smallest, most even more than that. I read packages and eat the sizes they call for now. When I eat out at a restaurant, I generally eat 1/2 and take the other half home for another meal. Sometimes Hubby and I share a meal which makes us happy when the bill comes! So, just be aware of portion sizes. I read this in a book, that skinny people only eat what looks “good” and they stop when they feel full, they don’t clean their plate! So, while I was still in bed from the surgery my oldest sons came over and brought their lunch to visit me while they ate. So, I watched them eat. One of them threw a french fry in his trash bag! Now, let me tell you potatoes were my downfall – I could eat them friend, mashed, run over with a car – it didn’t matter I was eating my potatoes and ALL of them, at every meal! So, I stopped him and said; “Why did you throw that in there?” He said “What?” he didn’t even notice! I said; “That French Fry!” He looked in the bag and said “Oh, it had black on the end.” WHAT?! lol I couldn’t have cared less what my french fries looked like or how old they were I would eat them anyway! So, watch a skinny person eat! It is eye opening! Now, the book I read said that many people have never felt hunger before. So, Hubby and I discussed it and he said he never had, he just ate “when it was time”. I now wait until I feel hungry. Another thing I learned was that your mind will tell you you’re hungry when you’re not. When was the last time you passed a bakery and saw or smelled the bread and desserts and didn’t say “Oh, I am so hungry.” It just kind of falls out of our mouths. During the time I was sick my Son in law would cook, and it smelled delicious wafting up to my room. One day I smelled something he was cooking, after I had already eaten, and I thought “Oh, that smells so good, and I am so hungry…” I stopped and thought about it. I wasn’t hungry at all! I had just eaten. I just enjoyed the smell of the food and my brain told me I was hungry! So, next time you feel that way, stop and check and see if you’re really hungry or if it’s just the sight and smell that is tricking you into thinking you are hungry. This one sounds like common sense, right? Well, I have decided I am a food addict. If you take food from my plate it really disturbs me, like there won’t be food later, if I need or want to eat! So, I had a hard time not “cleaning my plate”, as many of us were taught growing up. For years I ate until my stomach hurt and would be in pain later because of it. I had stomach aches and never knew why, now when I look back it was from me eating too much and stretching my stomach out! So, eat calmly and not so fast you can’t tell when you are comfortably full, and then quit when you feel full, but not over full. There will be more food when you get hungry again, whether it’s 2 hours or 5, there will be more food. Sounds silly, but, it was something I had to realize about my thought process with food. When you’re eating you want to eat your favorite foods first, so that when you ARE comfortably full you can stop and you ate what you liked best! Now, I don’t eat carbs, or at least I eat very little, same with sugar. That was a choice for my life, but, I don’t “deprive” myself. When there’s sweets or carbs and I really feel I have to have some, I just eat 1 bite and I am satisfied. For instance over the Holidays this year, I would just eat a bite of Hubby’s dessert and then I got to taste it, and I was satisfied. I honestly don’t miss the sweets, I wasn’t a sweet eater, really. What I am shocked about is how easy it has been to not eat potatoes, pasta, breads, etc. I don’t miss it – it’s been over 3 years now since I began this journey and I have to say, it’s just part of me now. I don’t have to put a lot of thought into it now, it’s just who I am . Sometimes people will say, “You’re still doing that no carb thing?”, it makes me laugh. So, those are my , nothing too hard. My advice? Find out what will work for you, for the rest of your life, that you can live with and not feel deprived! Weight Loss Help: How I Lost 100 Lbs And Kept It Off! Thanks for these tips and congrats on your journey! As for not eating pasta… you NEED to buy a sprializer! I bought one the other day and made zucchini “spaghetti” for my boyfriend and myself (he can – and will – eat an entire box of spaghetti by himself and not think anything of it). The pasta is literally just zucchini. It was SO good! You can also make squash “rice” with the sprializer and a food processor. Such great alternatives to carbs. I do have one and use it for zucchini pasta all the time – but not for the rice! I will have to try that! Thanks! !